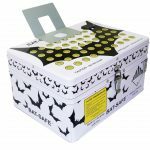 Lithium Polymer batteries are perhaps the most hazardous parts we deal with on a day to day basis when it comes to our miniquads. This is both because of their propensity to explode into a small fireball when mistreated and because of the massive amount of power they are capable of dumping out of their terminals. Most of the danger can be mitigated by proper technique and handling procedures, though. In this series, we aim to teach you how LiPo batteries fail and how you can prevent it. Just because there is no flames, don’t underestimate the danger. The heat generated by smoldering LiPos is enough to ignite any nearby flammable materials. Anyhow, just keep in mind that even though we refer to an “explosion” throughout this article, what we really mean is a puff of smoke and a lot of heat. So why do LiPos explode? It’s actually pretty simple – the Lithium ions inside a LiPo do not like to be exposed to air. All LiPo explosions occur for one reason: one or all of the cells in the pack get punctured or ruptured somehow, exposing their innards to the air. How violent the reaction is depends on how much electrical charge the battery has. To keep this simple, this is because in a fully charged battery, the reactive elements within it are more prone to violent chemical reactions when exposed to the air. When the battery is discharged, however, these same elements are being stored in a less-exothermic cocktail. 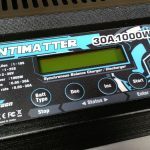 Overcharging occurs when a high voltage is applied across the cells of a LiPo battery. Typically, while charging, you want to raise the voltage on each LiPo cell to 4.2V (for normal LiPos). Voltages higher than this will cause an irreversible chemical reaction within the pack which will produce heat and gas. The battery will first begin to swell – at this point it has become irreversibly damaged. The next step is an explosion. Overcharging can also occur when you attempt to charge the battery more rapidly than it is capable of accepting that charge. In this case, the same situation happens: an irreversible chemical reaction generating heat, gas, swelling packs and eventually an explosion. Overcharging a LiPo in either way is the most dangerous failure mode. This is because the pack will generally explode after it has charged itself with a significant amount of energy – drastically increasing the amount of energy released in the explosion. Flames in this case are very likely – which can lead to home or garage fires if precautions are not taken. The best protection against overcharging is having a consistent charging habit that protects you from making mistakes when charging your batteries. Since this is such an insidious failure, we are dedicating an entire article to proper charging habits and care in our next article in this series. A hard crash or general mishandling can cause cells in the LiPo to get punctured. This will cause them to instantly explode, possibly chaining on to the good cells in the process. It’s worth considering when flying in rocky terrain what will happen if you crash into the rocks, battery first. This is why it is generally a pretty good idea to bring a fire extinguisher with you to the field. Just remember that the extinguisher will not put out a LiPo fire – save it to put out any flames that spread from the LiPo. Hopefully you will never need it. Some battery manufacturers, such as Dinogy, make battery packs with a protective layer of fiberglass on each side of the battery. This offers some compelling protection from explosions caused by punctures and is worth consideration if you are worried about this kind of failure. Sometimes when you drop or land on a LiPo battery, you may not damage it in a way that does not cause a puncture. Back in the RC Helicopter days, this type of failure was tongue-in-cheek called “tacoing a pack”, because the resulting LiPo, when bent over the nose of a helicopter, resembled a taco. While a taco’ed pack is generally still flyable, a LiPo that has a severe dent in it can be a ticking time bomb. 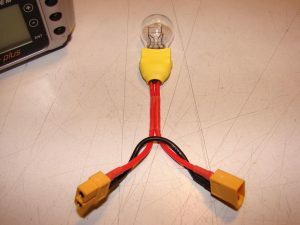 This is because one of the corners of the LiPo – normally the short one where the battery connector lives or the adjacent one – contains the cell terminals. If the dent causes these terminals to contact each other, they can short and cause a failure. Internal damage to the battery’s structure can also cause a similar failure. An electrical short is caused when any of the positive and negative wires in your power system contact each other unintentionally. When this happens with a sufficiently large wire, it can cause the battery to discharge at rates far exceeding its rating. This sets off a chain reaction whereby the battery starts to heat up and expand, increasing its internal resistance and thereby causing it to heat up and expand faster. At some point, one or all of the cells will rupture from the expansion, causing a release of hot smoke and possibly a fireball. 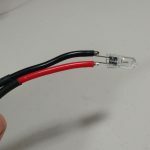 Using a fuse like this when initially powering up your quadcopter goes a long way towards protecting yourself against unintentional shorts. Issues with shorts most often occur on brand new miniquads shortly after they are built. In these cases they are caused by wiring errors or bad soldering. For this reason, you should always use some sort of fuse when plugging in your aircraft for the first time. Do not stop using the fuse until you have plugged it in and spun up the motors without the fuse blowing. Shorts can also occur due to crash damage. If a wire is torn off of a PDB it can flop around and short against another wire. 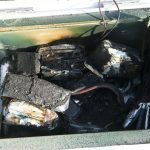 Likewise, damage to the wire sheathing on the battery connectors or the balance leads can leave bare metal exposed and ready to short, which can cause an explosion. A particular issue we have all had with the ZMRs we have flown is that the balance leads on the battery like to get sucked into the props in a crash, causing the metal connectors to be exposed. If any two of these connectors were to every touch each other, a short would form in one of the cells in the pack – which could be catastrophic. If this ever happens to you, handle the battery very gingerly, make absolutely sure none of the exposed wires come in contact with each other. You will need to either fix the connector, clip off the balance lead altogether (somewhat unsafe), or trash the battery altogether. While uncommon, this failure can also occur from a particularly hard flying session on a defective or well used battery. If your battery comes out of flight particularly hot or if the cells are squishy and majorly expanded, immediately remove it from your quad and place it someplace safe. Keep an eye on it for an hour or so until it cools down and seriously consider trashing it. 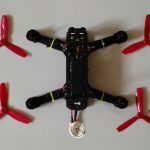 Note that it is normal for stressed batteries to get worn and even puff up a little bit if you are really flying your quadcopter hard – you are slightly damaging them by doing this but they will still work fine. You just need to keep an eye out for what is normal. A LiPo battery left in the sun will heat up and expand. In particularly hot areas, or when left inside of cars during the summer – this heat can be so great as to cause an explosion. I have not personally ever heard of a failure like this, but I have seen batteries that swelled due to heat caused by the sun that never performed correctly again.